Thanks to Christina Perri's Jar of Hearts that was included on her debut album called lovestrong, her fame has skyrocketed to the top. So far she has released one chart topping album and The Ocean Way Sessions EP. She has become a part of one of the biggest Hollywood movie of the time -- The Twilight Saga: Breaking Dawn -- through A Thousand Years, which was in the official soundtrack of the said movie. Now that we are finally on the Ber months, Christmas season is surely on the way. 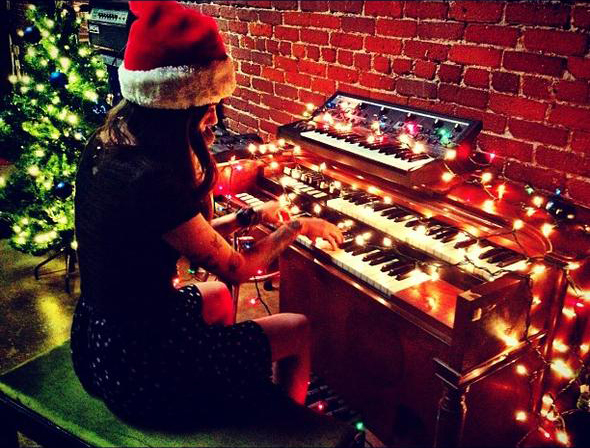 And as early as October 16, 2012 Christina Perri will serenade us all with hopefully some Christmas carols through her latest EP entitled A Very Merry Perri Christmas. No other details has been announced yet, but arent you excited about this? What can you say about the following A Very Merry Perri Christmas album cover? Of course, we all agree when she declared that all of her "dreams are coming true!" She has become one of the instant celebrities on the recent years, because she really do have the talent and the charm. Hopefully, we will also hear some news of her next studio album and I'll surely be clamoring to grab an early copy if I could. I also hope to hear some more details regarding Christina Perri's A Very Merry Perri Christmas so that I could share them to you. But for now: Merry Christmas, everyone!